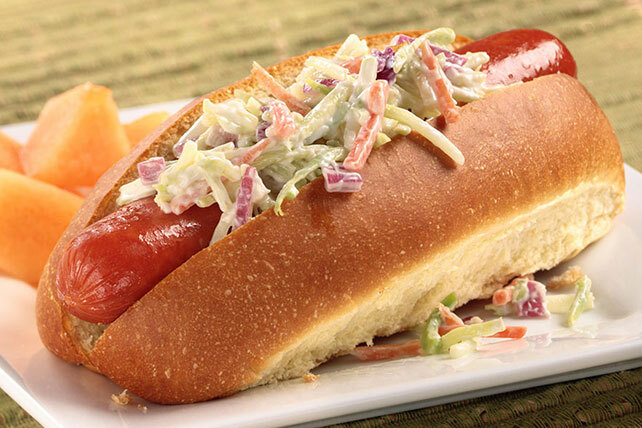 Sneak a few veggies onto the hot dog platter by topping the franks with crunchy, creamy broccoli slaw. Trust us—they'll thank you for it! Grill franks 7 to 9 min. or until heated through, turning occasionally. Meanwhile, combine slaw, onions and dressing. Place franks in buns; top with slaw mixture. Spice up your mealtime with these easy-to-make sandwiches. For added color, round out the meal with a serving of your favorite fresh fruit. Slaw mixture can be made ahead of time. Refrigerate up to 24 hours before serving. Prepare using OSCAR MAYER Selects Uncured Premium Beef Franks.